Agar Scientific offers latex particles for scanning electron microscope (SEM) calibration. Polystyrene latex particles are suitable for SEM calibration purposes. An internal standard of size can be obtained by mixing an appropriate concentration of these particles with the particles of unknown size being examined. A wide range of particle sizes are available, with approximate particle concentration and standard deviation. These values may vary between different batches. While these standard deviations are extremely small, the suspension may include some particles of material having different diameters from the mean. 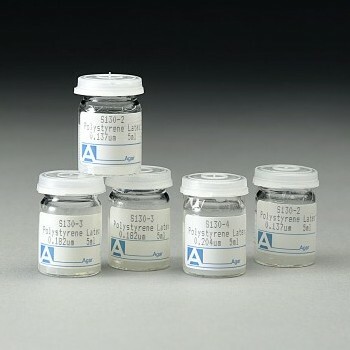 Polystyrene latex spheres can be utilized for TEM or SEM applications. All solutions are about 0.1 % weight by volume, and packed in 10ml vials.